Burned out on packing lunches yet? So I’ve got about a month of packing lunches under my belt for this school year. Am I running out of ideas yet? Nope. I’m still packing. But, I’m sure you’ve already guessed, I don’t pack your typical sack lunch. When I was in grade school, my parents had begun to fully embrace the natural foods approach to eating. We ate primarily homemade meals, we had a huge garden where we grew wonderful vegetables that we canned for use throughout the winter, and we raised *happy* chickens for stocking the freezer. As an adult, I’m now embracing this way of eating, but as an adolescent, I didn’t understand it. My packed lunches were different than everyone else’s. Sometimes I felt out of place eating my sandwich on homemade wheat bread when everyone else had Wonder bread with Jif peanut butter and Smucker’s grape jelly. And sometimes I got teased about the contents of my lunch. Did I lose any friends over it? No. Did I learn anything from it? Absolutely. My parents are very smart. They knew — long before it became “popular” — that whole grains, fresh fruits and vegetables, and chemical-free foods were what our bodies needed. I wish I had understood that better when I was a child. I want my kids to understand the choices I make for my family so when they go off to college, they are able to make healthy food choices on their own, and to defend their choices with facts. As I mentioned above, sack lunches in the 70’s generally contained a sandwich made of peanut butter and jelly or bologna and catsup on white bread, some kind of chips or Cheetos, and a Little Debbie snack cake or Ho-Ho. I don’t remember anyone having fresh fruit (besides me), but I do remember kids bringing in “fruit cocktail” in a little metal can with a pull-tab lid. Based on what I witnessed at Logan’s field trip last spring, sack lunches haven’t changed too much since the 70’s, except for the number of overly-processed options available to kids these days. As for drinks, I was sending 100% juice boxes, but my kids had a better idea. Logan said, “Mom, all these juice boxes are filling up the landfills.” So we bought reusable water bottles that fit in their lunch boxes. The night before, I fill them about halfway with either water, juice or Kool-Aid made with stevia, and stick them in the freezer. In the morning, I fill it the rest of the way and it stays cold all day, plus acts as an icepack for their food. And I can’t believe my two boys drank this for breakfast…and loved it! It was sweet, creamy, fruity, filling, delicious and packed with nutrition. Are you dying to know what it was? No, not really green in color. Green because it contained — now, don’t freak out — spinach! I just heard you say “yuck” and it’s okay. I thought the same thing. I’ve been reading about people who can’t get through their day without their morning green smoothie and I thought there was no way I could gag down a smoothie made with salad ingredients. But the more I read about them, the more interested I became. Calorie for calorie, spinach is one of the most nutrient-packed superfoods out there. It’s an excellent source of vitamins A, C, E, K, B1 and B6. It’s high in beta-carotene. In addition, spinach contains potassium, calcium, iron and a bunch of other minerals that can help control blood pressure and protect you from heart disease. As far as green smoothies go, I imagine this is one of the milder ones. I’ve seen recipes for ones that contain wheat grass and sea kelp and all kinds of strange “greens.” This is basically a fruit smoothie with the addition of spinach. I read somewhere online that as long as the smoothie has half of a ripe banana in it, you won’t taste the spinach. I was intrigued and decided to give it a try. As soon as I hauled out the blender, the boys got excited. I told them I was trying a new smoothie and that I would make mine first and they could taste it. If they liked it, I’d make them one, too. Well, they loved it. They had that for breakfast along with a piece of whole wheat toast with peanut butter and neither was whining an hour later that they were hungry. I hope you’ll give it a try, especially if you are already a smoothie-making kind of person. I was really surprised with it and, after I drank it, I felt really good about myself. Kind of pleased with myself for starting off my day with something so nutritious. I’ll bet Popeye felt that way every day! Put all ingredients in the blender and puree. Enjoy! p.s. Not a bad way to sneak veggies into your child’s diet! Does your kitchen have “LL”? One time when my parents were here for a visit, my dad said, "Uh, Tam…you know it's time to clean the crisper drawer when you have LL." I said, "What's LL?" He replied, with a grin on his face, "Liquid Lettuce." He then held up a bag from the back of the bottom crisper drawer. It originally contained pre-cut romaine lettuce. It had liquified. Gross. I'm sure I'm not the only one who doesn't dig to the bottom of the refrigerator crisper drawer regularly, only to discover a few weeks later a forgotten box of mushrooms or bag of fresh parsley. Am I? I do have to say, though, that ever since that incident, I've tried to stay on top of it a little better. I do occasionally discover something slightly past its prime, but you won't find LL in my fridge anymore. The best part of regularly investigating your produce supply is that you can pull together amazing salads while your veggies are still fresh. Last night's dinner salad included all kinds of things that needed to be eaten before they perished! My hubby even commented, "this salad is delicious." In fact, it would be beautiful as a summer picnic salad. It had green leaf lettuce, baby spinach leaves, shredded carrots, green onions, celery (for my blood pressure! ), sliced strawberries and toasted pecans from the pantry. I drizzled mine with a balsamic vinaigrette. Jason and the kids had poppy seed dressing. I served it alongside grilled sesame tilapia for Jason and the kids, grilled Gardein filets for me, and baked potatoes. 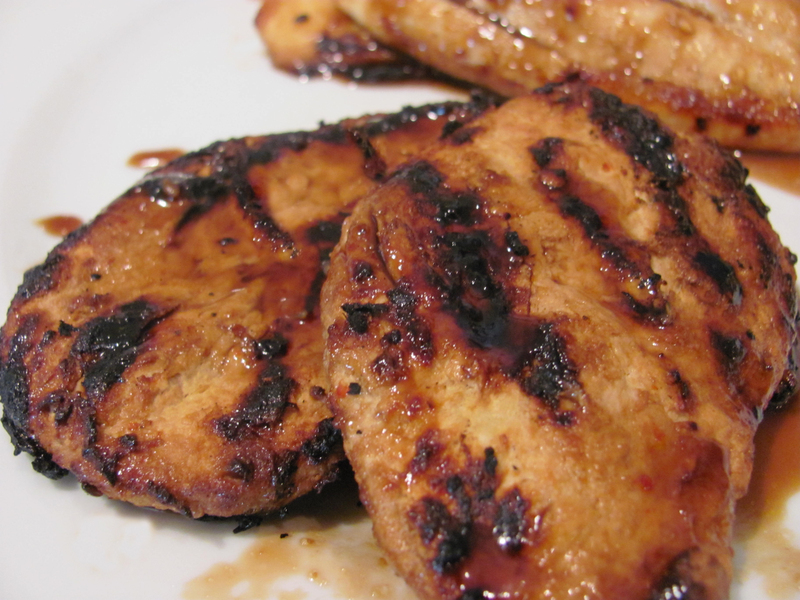 If you haven't tried the Gardein "chicken" breast filets yet, they are worth a try. Not only are they made from healthy organic ingredients, they're the most chicken-like chicken substitute I've had so far. The look and texture is exactly like chicken. The taste is very good, although I've discovered that marinating them makes them really good. The first time I cooked them, I pulled them out of the package, tossed them on the grill, and then brushed them with BBQ sauce in the same way I cooked real chicken for everyone else. They were not as good as I'd hoped. Yesterday, I pulled them out of the package and put them in a plastic container and smothered them in the sesame sauce I was using for the tilapia. They were in the marinade sauce for a few hours. Then I continued to brush them with sauce while grilling. When I pulled them off the grill, I gave them one last drizzle of sauce. They were fantastic. So the next time you're digging through the fridge, start mixing and matching and see what you can create. Most likely, you'll be pleasantly surprised! The other day, I saw a recipe on the Whole Foods website that looked like just the thing my kids would love to eat for dinner — except it used cream cheese, which meant I would have to make something different for myself. I chose, instead, to try to make a vegan version that would be similar in taste, and it worked! This sandwich spread came out creamy and delicious and they gobbled up their dinner. The only problem was that the sandwiches were kind of messy because the sauce I made isn't as thick as cream cheese. It was more like the consistency of mayonnaise. I may have to work on that the next time I make it. Now, don't freak out when you see that the spread is made with tofu. Trust me when I tell you NO ONE at my dinner table suspected tofu. This spread is sweet and creamy, and would make a fabulous dip for fresh fruits. In addition, it provides a good source of protein since it's made with tofu and cashews. Tofu has really gotten a bad rap in America, unfortunately. Most people won't even try it because they think it's going to be disgusting. I'll admit that I don't really care for it when presented as a meat substitute, like cubes of tofu in a stir fry or something. I've had good luck using the soy crumbles as a substitute in chili, but I didn't care for them as a substitute for taco meat. I've also had many successful recipes when using it in a dip, cream sauce, or smoothie. So if you've tried tofu and didn't like it, try it again in a different way, like in my recipe below. You might find you like it! Make the spread a day in advance, if you can, so the flavors have time to meld. 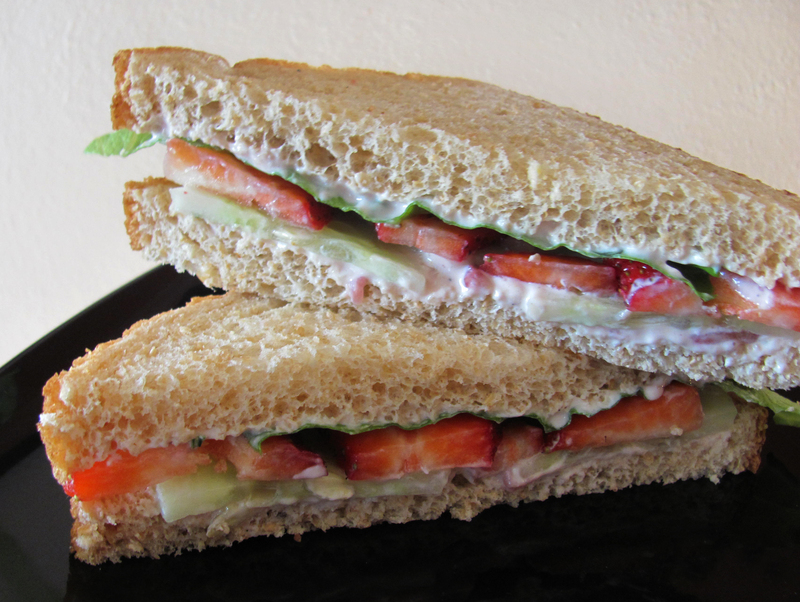 In a blender or food processor, add all sandwich spread ingredients except strawberries and mint. Puree until smooth, scraping down the sides of the bowl as needed. Pour into a bowl. Mash the diced strawberries with a fork. Stir into the spread, along with the chopped mint leaves. Cover and refrigerate at least 4 hours. To assemble, thickly spread one side of each piece of bread with the sandwich spread. 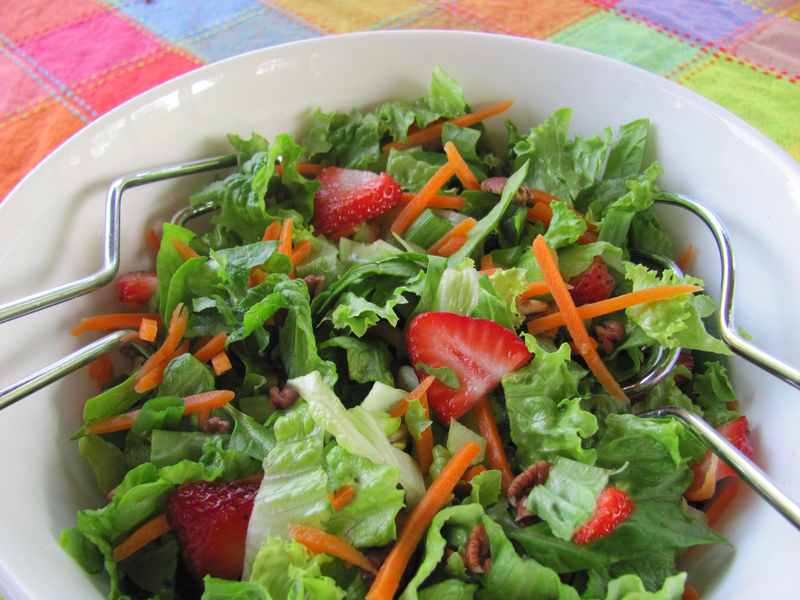 On 5 of the slices, layer strawberry slices, cucumber slices, red onion slices and a lettuce leaf. Top each with the remaining 5 slices of bread, spread side down. Slice in half and enjoy! *Making these on those little appetizer-size bread slices would make delicious tea sandwiches for a party!